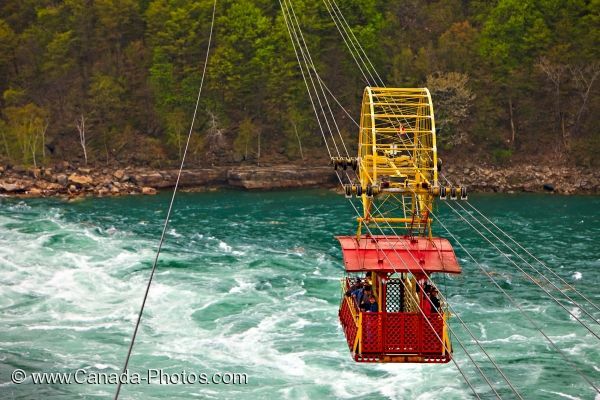 Along the Niagara River Parkway, 3.2 miles north of Niagara Falls in Ontario, Canada, the Spanish Aero Car, now known as the Whirlpool Aero Car, takes passengers on a ride over the Whirlpool Rapids, 250 feet above the river. With permission from the State of New York and the US Government, due to the location it would cross over the Niagara River, the Spanish Aero Car was built in Bilboa, Spain and began running in August, 1916. Picture of people riding the Whirlpool Aero Car over the rapids along the Niagara River in Niagara Falls in Ontario, Canada. After being bought out in 1961, there were a few upgrades done to the Spanish Aero Car and in 1984, the Niagara Parks Commission took over ownership with extensive repairs being done. A maximum of 40 people can ride on the Whirlpool Aero Car at one time as it travels above the Whirlpool Rapids from Colt's Point to Thompson Point. The Spanish Aero Car passing above the Whirlpool Rapids of the Niagara River down stream from the famous Niagara Falls, Niagara River Parkway, Ontario, Canada.